Ennis is a Redguard farmer who can be found at the Cowflop Farmhouse in Rorikstead. He shares his home with Reldith, the Altmer with whom he has lived since she rescued him after he was orphaned. His prize goat is stolen by you and sold to a giant during the related quest. He wears a belted tunic, a pair of boots, and a hat. He carries an iron war axe, an iron dagger, and a key to the farmhouse. Ennis starts his day at 8am when he wakes up to work on his farm for twelve hours, ending his workday at 8pm. The only break from his work during the day is at 6:10pm, when he will take an hour to eat. Once he is finished with his work for the day, he will head inside his home to relax from the day's stresses. He will finally retire to his bed for the day at 11pm; waking up at 8am to start the next day. If you speak to Ennis before A Night To Remember he will introduce himself by saying, "Name's Ennis. If you've got friends who do business in Whiterun, they might know me." With further prodding he will provide comments about Reldith, and his business dealings with Whiterun: "You talk to Reldith yet? She's like a mother to me." "You here from the city? I visit Whiterun from time to time, mostly to make deals." 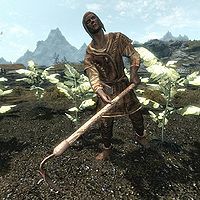 "Reldith is the hardest-working farmer in Rorikstead, but I'm the one with a head for business." "Sorry's not good enough! Not while my Gleda is still out there, alone and afraid. You kidnapped her and sold her to that Giant." "Is that so? Does the name Gleda ring a bell? The star beauty of my farm? Kidnapped by a drunk lout and sold to a Giant? You'd better remember her right fast, before I call the guards and have you hauled away." Help me retrace my steps and I'll pay you for the goat. (Bribe: 1000 gold) Succeed: Fine, but I'll still be missing my Gleda. Doubt I'll ever have a prize winning goat again. Most of what you said was gibberish but you left a note. The only bit I could read was "after repaying Ysolda in Whiterun. Fail: There's not enough money in the world to replace Gleda. Tell me everything and you won't end up like your goat. (Intimidate) Succeed: Okay, okay. Most of what you said didn't make sense but you left a note. The only bit that I could read said "after repaying Ysolda in Whiterun." That's all I know. Fail: Do what you have to do, I'm not giving up on Gleda. I need to find Sam and the staff, in order to get Gleda back. (Persuade) Succeed: I suppose that makes sense. You didn't mention a Sam and nothing you said about the staff made sense. You left a note but it was mostly gibberish, the only bit I could make out was "after repaying Ysolda in Whiterun. Fail: You didn't seem to need either to sell Gleda to the Giant in the first place. I think you'll figure it out. After returning the goat to Ennis, you can ask him for help in retracing your steps. With Gleda home, he will be grateful and freely offer some assistance: "Gleda! And not a scratch on her! Happy day! I still can't figure out why you stole her. You left a note explaining it, but half of it was gibberish and the rest had mead spilled on it. Only bit I could make out was "repaying Ysolda in Whiterun," and even that's mostly scribbles. Guess you could try there." If you then question him further about what you said regarding the staff, he will once again explain: "You said a whole lot of nonsense about selling Gleda to hire a priestess for some big event. There was a bit of talk about some staff you had in safe keeping. Never said where, but you sure didn't have it with you!" Ennis will often interact with the other residents of Rorikstead, particularly Reldith. Ennis will also discuss his business with Jouane Manette. He will also converse with Rorik occasionally. 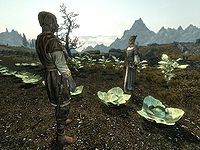 If you ask Reldith where she sells her surplus crops, she'll mention Ennis in her response: "In Whiterun, mostly. Ennis handles the business arrangements, but I know that he has a few purchasers who give us a fair price. Ennis prides himself on his shrewd business schemes. For my part, I'm far happier working with cattle and crops than with people." Patch 1.5 sets Ennis as essential. Although the patch notes the change as essential "until his part in A Night To Remember is completed", he is simply set as essential for the entirety of the game. This page was last modified on 14 July 2017, at 13:14.